Short Sales Of Homes Bring Hope And Frustration In so many ways, selling for less than what's left on the mortgage has a lot of appeal for homeowners who want to avoid foreclosure. And for buyers, a short sale can mean a good deal on a house. But short sales often end up keeping buyers and sellers in a protracted limbo. 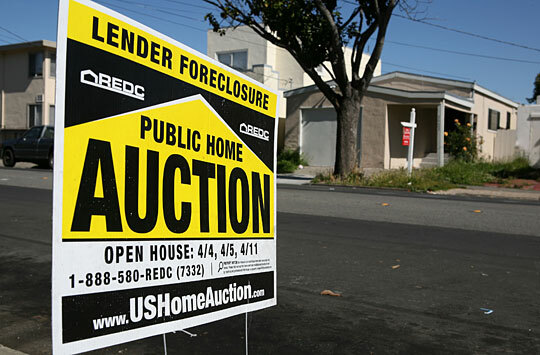 A foreclosure sign in Richmond, Calif. To qualify for a short sale, homeowners cannot already be in foreclosure. In so many ways, so-called short sales of homes hold a lot of appeal. For the homeowner who must sell for less than what's owed on their mortgage, it can be a way out without sustaining as much damage to their credit as they would in foreclosure. 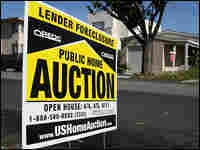 For the mortgage lender, it means taking less of a loss than if the property goes into foreclosure. And for the buyer, a short sale represents a good deal on a house. Some homeowners need to sell because of a financial hardship or other circumstance, but end up "short" because they're unable to pay off the full amount of the mortgage from the sale proceeds. To qualify for a short sale, homeowners cannot already be in foreclosure. They also must get approval from their lender or lenders — if they have more than one lien on the home. That's because the lenders stand to recover less than the original loan amounts. But in most cases, short sales end up keeping buyers and sellers in protracted limbo. Despite the difficulties in making it work, short sales now make up a huge percentage of sales in some areas of the country. Foreclosures and short sales made up nearly half of all homes sold during the first quarter, according to a survey released recently by the National Association of Realtors. Fannie Mae, which owns or controls a third of the nation's home loans, said the number of pre-foreclosure, or short sales, on its properties increased to 5,971 during the first quarter, from 4,668 during the previous quarter. Many people in government and real estate argue that making it easier to get distressed homes off the market and occupied by new owners is critical to achieve a housing recovery. Two months ago, Jack Archer and his family put a $500,000 bid on a home in Manassas, Va. It could be a great deal, considering the same house sold a few years ago for more than $600,000. But a number of factors make closing the deal uncertain. In order for the current homeowners to sell, their mortgage lender first needs to agree to recoup less money than the original loan amount. Since the owners also have a home-equity loan, their second lender also needs to agree to take a loss. Finally, the homeowners have mortgage insurance, which means the lenders could simply kill the deal if they think they stand to recover more by letting the property go into foreclosure than by agreeing to a short sale. Archer says he has no idea which party is holding up his offer. "We're getting a little tired at this point," he says. "We're giving it two more weeks" before deciding whether to walk away and just renovate their current two-bedroom home in Falls Church, Va.
"It's pretty painful, but sometimes you just don't have much choice," he says. "There's just not that many normal sale homes in some areas." He knows this from poring over real estate Web sites and listings every night. Every other home close to the one he bid on is also in short sale — meaning they might be equally time-consuming to buy. Ron Phipps, a real estate agent in Rhode Island, represents both buyers and sellers in short sale deals, which now make up about a third of his overall business. He says the primary problem is that lenders are overloaded with requests, and many are unwilling to sign off on short sales. The problem is worse when the seller has a second loan on the home. "It used to be all the qualification was based on the buyer," he says, but now real estate agents dealing with short sales spend far more time assessing whether the seller is likely to get lender approval on a deal. One thing greatly improved how many deals closed, Phipps says: Several months ago, he hired a lawyer to coordinate between all the parties — the borrower, the lenders, the insurers and the agents. That has meant that about half of all short sale deals are going to settlement, up from only 10 to 15 percent previously. Last month, the Obama administration said it wanted to make the short-sale process more uniform by creating standards around the application and approval process. The administration is expected to release details of its plan within a month. That will come too late for Jason Hall, a federal contractor who walked away from a protracted wait for a short sale late last year. Hall and his wife bid on a condo in Arlington, Va., then waited for weeks without any guidance on whether they were close to a deal. "I mean, I was calling people up saying, 'Listen, buddy, you know you're ruining my life here.' "
Hall said they finally pulled their offer and paid more for a different condo down the street, which was not in short sale. Meanwhile, the condo they bid on, he says, remains for sale — at a reduced price.